Beginner Golfers. Are more than welcome. There is a “Special limited Fee” for beginners which is guaranteed not to change for 3 years. This is very attractive for anyone interested in joining and for those purchasing vouchers to give a life changing experience to someone. New members are now been accepted. The membership categories have been increased to suit all sectors of the community. All current members are encouraged to introduce at least “ONE NEW MEMBER” Lady or Gent, Junior or Student, Seniors Juveniles and Family, Active Retiree’s, Special Needs or any person interested in taking up the sport. It will be a huge advantage to building the club membership and profile. Lapsed Members; There is a great return by Lapsed members and all are Welcome Back; A special rate for “Lapsed Members” that have not played/joined for “One Year” can avail of a “welcomed back” once-off, special rate of €200 and Ladies €170. This is a great motivation opportunity for golfers, Ladies and Gents who want to return to this great social game. All current members are encouraged to promote this offer to help those that want to return to the Club. Registrations Forms are now available on-line on our web site, just select the “Membership” tab and it will give you the option to pay by Pay Pal or Credit Card. or collect an application form at the club house or contact Martin Bohan 087 0509278 or any of the committee members. Payment options can also be made through the Golf Club web site link; http://templemoregolfclub.ie/membership/ All will be more than welcomed. The Ideal Golf Gift; Give a life changing Sport experience to someone. The Ideal gift for anyone who would like to take part in an active exercise sport. Golf is that Ideal Gift. Buy a membership Voucher now. Contact Martin Bohan 087 0509278 or any of the committee for to purchase the “Ideal Active Present”. Private Donations; Private donations will be greatly received and used exclusively for the purchase of new equipment and Course Development. Just select the “Membership” tab and then select “Make a Donation” tab on the Club Web Site http://templemoregolfclub.ie/membership/ , or in confidence contact; Martin Bohan 087 0509278. The Seniors; On Thursday 21st. Feb. There is a continued fantastic turn out for this event. The weather was fantastic and the course is in fantastic condition. A notable, great indication of the growing interest in this event which is very popular in the Club. It is also an ideal opportunity for “Lapsed Members” to return to the club. There will be a great “Welcome Back” for them, also, great team support, banter and refreshments. “Make your return to Golf Now”. Call in on Thursday mornings at 10am. To play or at 12noon approx. for to join in the Cuppa and Banter. Results, Thurs.21st. Feb. 1st. Team; John Mullally, Jerry Keegan, Mick Connell 52pts. 2nd. Team; John Hassett, Jerry Murray, Phil Ryan, Michael Maher 51pts. 3rd. Team; Bertie Keane, George Collins, Ollie Murray 49pts. Spring League; Commenced on Saturday 23rd. Feb.
Central Towns. The Draw for 2019 will be made early in March; Manager; TBC. JB Carr; Draw will be made in early March 2019. Manager; Liam Leahy. Sat. 13th. April; White Dowling Society. Sunday 28th. April; Munster Country Clubs Cup, At Doneraile Golf Club, Round 1-Spanish Point-V-Templemore. Manager; Liam Leahy & Dinny Touhy. Sunday 12th. May; Senior Interclub Fourball. Over 55yrs., No Handicap Limit, Combines 42max. Round 1-Tipperary-V-Templemore. Manager; Seanie Gleeson. Saturday 25th. May; AIG Pierce Purcell Shield, At Clonmel Golf Course, Round 2- Ballykisteen-V-Templemore. Manager; Mick Keely. Sunday 2nd June; GUI All Ireland Inter Club Four-Ball Championship. Round 1- Cahir Park-V-Templemore. Manager; P.J. Leahy. Thursday 13th. June; Irish Mixed Foursomes, Tipperary Golf Club, Round 1-Templemore-V-Ballykisteen. Managers; Captains; Captains Tony O’Toole, Lorraine Ryan/Seamus Bourke. Presidents Prize; Sunday 28th. July. Captains Prize; 16th. – 17th. – 18th. Aug.
Diageo Mixed. Semi Final Sat.17th. Aug./Final Sun.1st. Sept. Manager, TBC. White Dowling Society; Sat. 26th. Oct.
White Dowling Society; Sat. 14th. Dec.
See Notice Board for more details or contact Club Competition Secretary; Liam Leahy, 087-4115773.
above photo;. 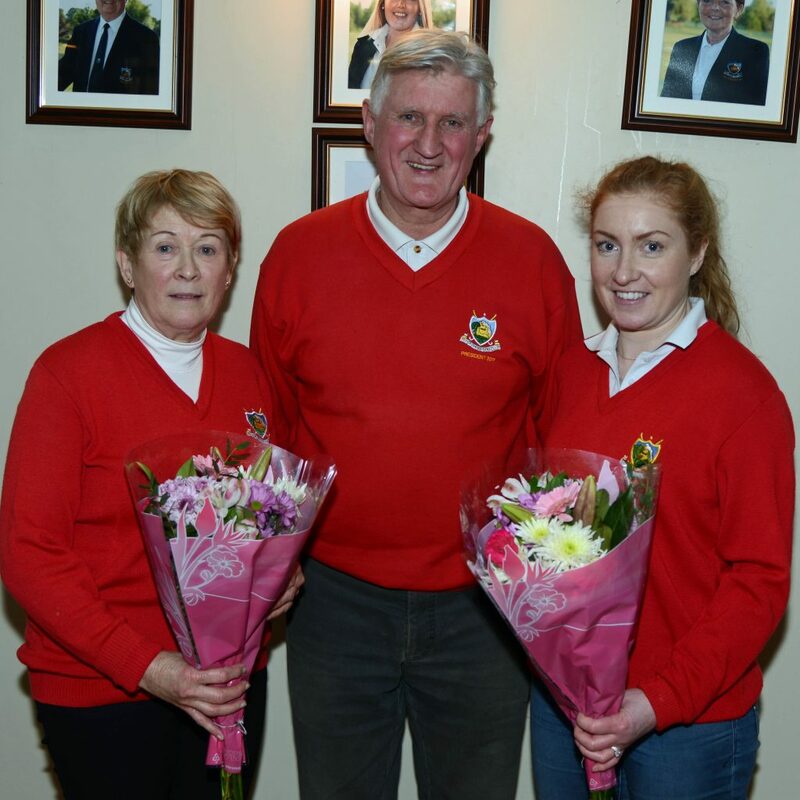 Templemore Golf Club Captains Drive-in, Presentations to Lady President Mary Hogan and Lady Captain Lorraine Ryan by Captain Tony O’Toole. Photo by; Seamus Bourke. Open 11hole weekly Competition; The course is in excellent playing condition and all golfers are more than welcome to participate in this 11hole open competition. It will continue up to the end of Feb. to the start of the spring league. It’s an ideal opportunity for all competitive members to stay in shape for the upcoming “Spring League”. Results for; Monday 28th. Jan to Sunday 10th. Feb. Tom McGrath 28pts. 2nd. Tom Kennedy 27pts. John Hassett 26pts. The Spring League 2019 Stableford; Club members interested in participating in the Spring League are encouraged to enter their names on the notice in the club house. Entry fee €20. The fee must be paid prior to the team selection so all that have their name on the list are requested get in their fee as soon as possible. This is a great team building event, all members should give it their full support. It will be a decider for competitors to make the Cups and Shield competition teams. GUI AGM. 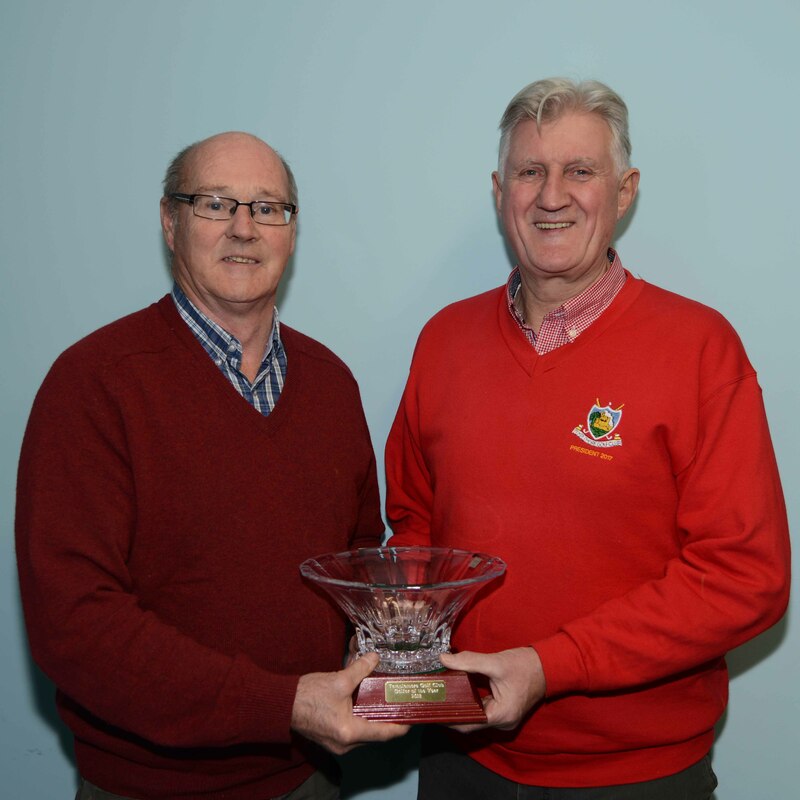 Captain Tony O’Toole and Secretary Pat O’Connell represented the club on Sat. 16th. at the GUI, AGM in Knightsbrook Golf Club inTrim. There was a large attendance of nationwide Clubs. Templemore Golf Club is very proud that the outgoing GUI president is a member of Templemore Golf Club. We wish John all the best in his golfing future and acknowledge the pride his position brought to the club. CGI Local Support Officer Damien Connolly gave a detail presentation of the supports and services available to clubs which include a combination of Consultancy, Online Assessment, Workshops and Guidance along with access to a bank of templates and resources and cover a wide range of core business areas including, Governance, Finance, Planning and Membership Development. This is a new initiative that will develop the club into the future and create an atmosphere that demonstrates Templemore Golf Club as an Active. Progressive and an all-inclusive Club. 2019 Cups and Shields Competitions; The 2019 Cups and Shield competitions are now posted on the locker room notice board. All members interested in taking part in any of these competitions should make contact with Competition Secretary Liam Leahy, 087-4115773 as soon as possible. Special Membership Fees for beginners, 2019; There is a “Special limited Fee” for beginners which is guaranteed not to change for 3 years. This is very attractive for anyone interested in joining and for those purchasing vouchers to give a life changing experience to someone. New members are now been accepted. The membership categories have been increased to suit all sectors of the community. All current members are encouraged to introduce at least “ONE NEW MEMBER” Lady or Gent, Junior or Student, Seniors Juveniles and Family, Active Retiree’s, Special Needs or any person interested in taking up the sport. It will be a huge advantage to building the club membership and profile. Lapsed Members are Welcomed Back; A special rate for “Lapsed Members” that have not played/joined for “One Year” can avail of a “welcomed back” once-off, special rate of €200 and Ladies €170. This is a great motivation opportunity for golfers, Ladies and Gents who want to return to this great social game. All current members are encouraged to promote this offer to help those that want to return to the Club. Registrations Forms are now available on-line on our web site, just select the “Membership” tab and it will give you the option to pay by Pay Pal or Credit Card. or collect an application form at the club house or contact Martin Bohan 087 0509278 or any of the committee members. Payment options can be made through the Golf Club web site link; http://templemoregolfclub.ie/membership/ All will be welcomed. Give a life changing Sport experience to someone; The Ideal Golf Gift is a membership Voucher. contact Martin Bohan 087 0509278 or any of the committee for to purchase the ideal Golf present. Private Donations for Equipment Development; All private donations will be greatly received; Just select the “Membership” tab and then select “Make a Donation” tab. The Club will very much appreciate any donations that will help towards the purchase of new equipment, or in confidence contact; Martin Bohan 087 0509278. The Seniors; On Thursday 14th.Feb. There was a fantastic turn out for this event. it’s a great indication of the growing interest in this event and is very popular in the Club. It is also an ideal opportunity for “Lapsed Members” to return to the club. There will be a great “Welcome Back” for them, also, great team support, banter and refreshments. “Make your return to Golf Now”. The successful Weekly 11hole Open Singles will continue up the start of the Spring League. See Notice Board for more details on club and shield competitions or contact Competition Secretary; Liam Leahy, 087-4115773.
above photo;. 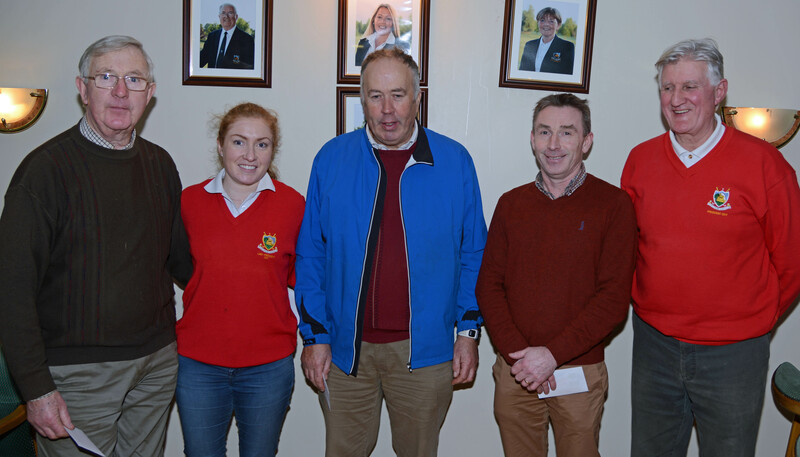 Templemore Golf Club, Embraces New Supports from “Confederation of Golf Ireland”, Lady Captain Lorraine Ryan, CGI Damien Connolly, Club Captain Tony O’Toole, Back Row L-R. Committee Members, Tommy Foley, Pat O’Connell, Jim Ryan, Phil Ryan, Michael Purcell. Photo by; Seamus Bourke. Open weekly Competition; Will continue up to Sunday 17th. Feb. for the start of the spring league. It’s an ideal opportunity for all competitive members to stay in shape for upcoming “Spring League”. The course is in great shape and playing well considering the recent inclement weather. 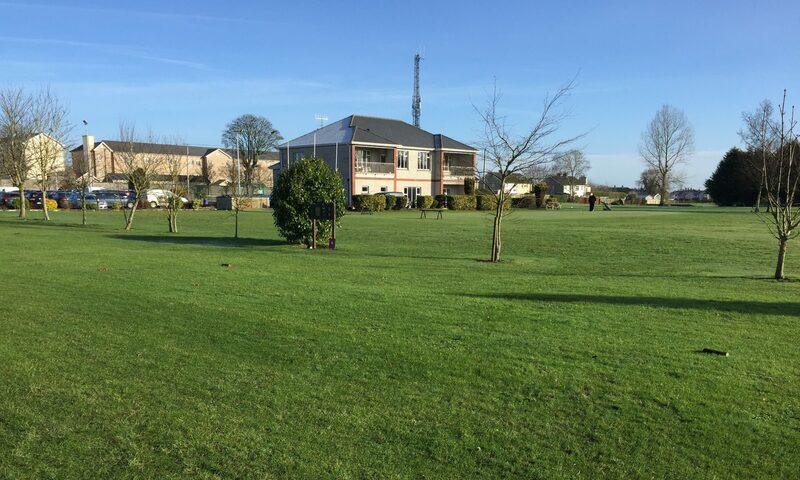 The Spring League 2019 Stableford; Club members interested in participating in the Spring League are encouraged to enter their names on the notice in the club house. The 1st. round will start on the 18th. Feb. Entry fee €20. This is a great team building event, all members should give it their full support. It will be a decider for competitors to make the Cups and Shield competition teams. Results for; Monday 21st. Jan to Sunday 27th. Jan. Denis Ryan 28pts. 2nd. Jerry Keegan Jnr, 28 Pts. 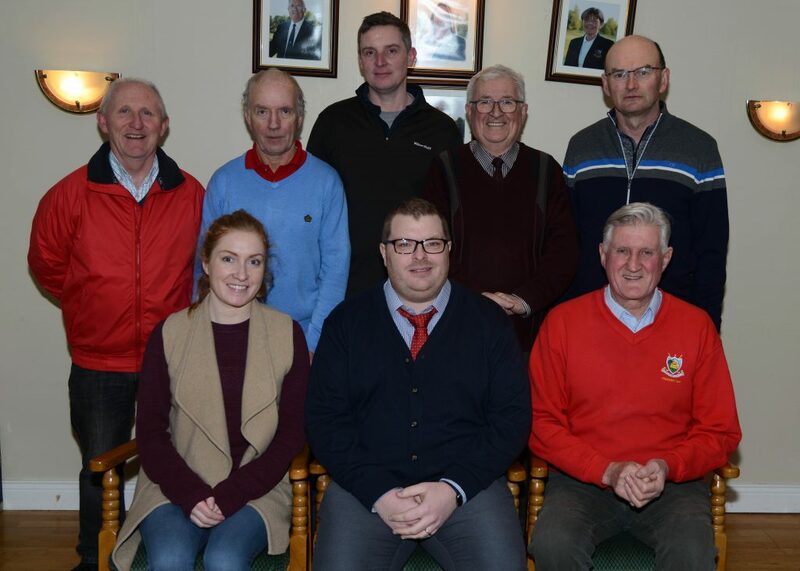 Confederation of Golf Ireland, (CGI); Last Wed. 6th Feb. Templemore Golf Club committee hosted a meeting with CGI Local Support Officer Damien Connolly. CGI offers a combination of Consultancy, Online Assessment, Workshops and Guidance along with access to a bank of templates and resources and cover a wide range of core business areas including, Governance, Finance, Planning and Membership Development. This is a new initiative that will develop the club into the future and create an atmosphere that demonstrates Templemore Golf Club as an Active. Progressive and an all-inclusive Club. 2019 Cups and Shields Competitions; The 2019 Cups and Shield competitions are now posted on the locker room notice board and listed below. Any enquiries or more information required, contact Competition Secretary Liam Leahy, 087-4115773. Special Membership for beginners, 2019; There is a “Special limited Rate” for beginners which is guaranteed not to change for 3 years. This is very attractive for anyone interested in joining and for those purchasing vouchers to give a life changing experience to someone. New members are now been accepted. The membership categories have been increased to suit all sectors of the community. All current members are encouraged to introduce at least “ONE NEW MEMBER” Lady or Gent, Junior or Student, Seniors Juveniles and Family, Active Retiree’s, Special Needs or any person interested in taking up the sport. It will be a huge advantage to building the club membership and profile. “Welcome Back” to Lapsed Members; A special rate for “Lapsed Members” that have not joined for “One Year” can avail of a “welcomed back” once-off, special rate of €200 and Ladies €170. This is a great motivation opportunity for golfers, Ladies and Gents who want to return to this great social game. All current members are encouraged to promote this offer to help those that want to return to the Club. Registrations Forms are now available on-line on our web site, just select the “Membership” tab and it will give you the option to pay by Pay Pal or Credit Card. or collect an application form at the club house or contact Martin Bohan 087 0509278 or any of the committee members. Payment options can be made through the Golf Club web site link; http://templemoregolfclub.ie/membership/ All will be welcomed. Give a life changing experience to someone; The Ideal Golf Gift is a membership Voucher. contact Martin Bohan 087 0509278 or any of the committee for to purchase the ideal Golf present. Equipment development Private Donations; All private donations will be greatly received; Just select the “Membership” tab and then select “Make a Donation” tab. The Club will very much appreciate any donations that will help towards the purchase of new equipment, or in confidence contact; Martin Bohan 087 0509278. The Seniors; On Thursday 7th.Feb. There was a great turn out for this event after very inclement weather that cancelled the event last Thursday 31st. it’s a great indication that this event is very popular in the Club. It is also an ideal opportunity for “Lapsed Members” to return to the club. There will be a great “Welcome” for them, also, great team support, banter and refreshments. “Make your return to Golf Now”. Results for Thurs.7th. 1st. Team; Gerry Keegan, Ollie Murray, Sean Lee, Pat O’Connell. 52pts. 2nd. Team; John Hassett, Seanie Gleeson, Pat Maher, Tom Kennedy. 50pts. 3rd. Team; Liam Daly, James Murrey, Tony O’Toole, John Mullally. 47pts. The successful Weekly 11hole Open Singles from Monday to Sunday will continue up to the Sunday 17th. Feb. Pre the Spring League. Sunday 28th. April; Munster Country Clubs Cup, At Doneraile Gol Club, Round 1-Spanish Point-V-Templemore. Manager; Liam Leahy & Dinny Touhy. Sunday 12th. May; Senior Interclub Fourball. Over 55yrs., No Handicap Limit, Combines 42max. Round 1-Tipperary-V-Templemore. Manager; PJ. Leahy. Sunday 2nd June; GUI All Ireland Inter Club Four-Ball Championship. Over 30yrs, Handicap 15+, Combined 34min. Round 1- Cahir Park-V-Templemore. Manager; Seamus Bourke. Thursday 13th. June; Irish Mixed Foursomes, At Tipperary Golf Club, Round 1-Templemore-V-Ballykisteen. Managers; Captains; Club Captains Tony O’Toole, Lorraine Ryan & Seamus Bourke. See Notice Board for more details or contact Competition Secretary; Liam Leahy, 087-4115773. Open weekly Competition; The inclement weather has curtailed the activity in this great competition. As soon as the weather settles the competition will continue. It’s an ideal opportunity for all competitive members to stay in shape for upcoming Cups and Shield Competitions also for all golfers to get in their game of golf on this fantastic course. Special Membership for beginners, 2019; There is a “Special limited Rate” for beginners which is guaranteed not to change for 3 years. This is very attractive for anyone interested in joining and for those purchasing vouchers to give a life changing experience to someone. New members are now been accepted. The membership categories have been increased to suit all sectors of the community. All current members are encouraged to introduce at least “ONE NEW MEMBER” Lady or Gent, Junior or Student, Seniors Juveniles and Family, Active Retiree’s, Special Needs or any person interested in taking up the sport. It will be a huge advantage to building the club membership and profile. Registrations Forms for new members are now available on-line on our web site, just select the “Membership” tab and it will give you the option to pay by Pay Pal or Credit Card. or collect an application form at the club house or contact Martin Bohan 087 0509278 or any of the committee members. Payment options can be made through the Golf Club web site link; http://templemoregolfclub.ie/membership/ All will be welcomed. The Seniors; On Thursday 31st. Jan. the weather changed to a severe frost condition. Unfortunately, this week as postponed. Next Seniors will be on Thursday; 7th. February. Sunday 28th. April; Munster Country Clubs Cup, At Doneraile Gol Club, Round 1-Spanish Point-V-Templemore. Manager; Liam Leahy. Sunday 2nd June; GUI All Ireland Inter Club Four-Ball Championship. (Cashman) Over 30yrs, Handicap 15+, Combined 34min. Round 1- Cahir Park-V-Templemore. Manager; Seamus Bourke. Thursday 13th. June; Irish Mixed Foursomes, At Tipperary Golf Club, Round 1-Templemore-V-Ballykisteen. Managers; Captains; Club Captains Tony O’Toole and Lorraine Ryan. JB Carr TBC. Draw will be made in early March 2019. Manager; Liam Leahy.